On Sunday last we went hill walking and found ourselves in a structure over 5,000 years old! It's not very often you can say that. 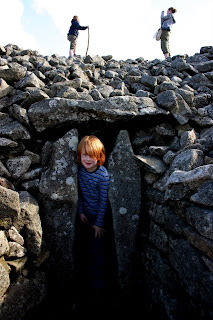 We had climbed Seefin Mountain (621m) in the Wicklow Mountain National Park up to the cairn on it's summit which is actually a Megalithic passage tomb. Its hard to belief structures like this dot the Irish landscape and are are completely unmaintained (which is a shame) but there wasn't another soul around which made it rather special.